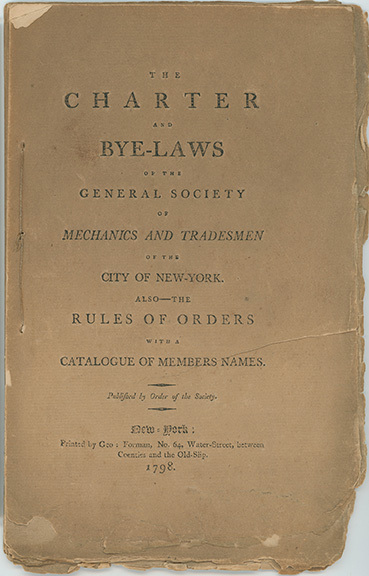 This collection of 364 objects is composed of selected archival materials and museum holdings from The General Society of Mechanics and Tradesmen of the City of New York (GSMT). Founded in 1785, The General Society initially served as a benevolent organization that provided mutual support to fellow craftsmen and artisans in need. This philosophy of practical philanthropy has been maintained for over 230 years in the form of the second-oldest library in New York (since 1820), an active program of lectures (since 1837), and a tuition-free evening trade school (since 1858). Since its inception, The Society has counted many prominent New Yorkers among its over 4000 members such as Andrew Carnegie, Peter Cooper and Abram S. Hewitt. The items presented in the Industry and Culture Collection document a wide variety of General Society activities including patriotic, civic, educational and literary pursuits.